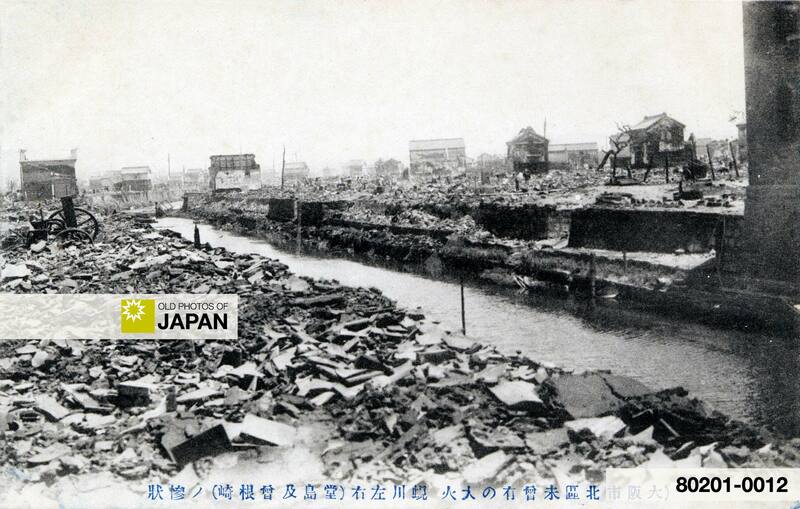 Dojima and Sonesaki on both sides of Osaka’s Shijimi River (蜆川) were devastated by the Great Kita Fire of July 31, 1909 (Meiji 42). The river, which played an important part in Osaka culture was filled in with the rubble and forever vanished from Osaka’s town scape. For more information about this devastating fire, read Osaka 1909 • Great Kita Fire. The Google map below is centered on Oebashi Bridge, in the middle of the disaster area. You can also licence this image online: 80201-0012 @ MeijiShowa.com. The only thing that exists now is a stone marker on the cornerstone of a building that reads “shijimibashi”.